They wanted to find the right HMI/SCADA solution to fit their needs, so they asked Kasa Industrial Controls for help. Kasa is a leader in the industrial controls industry, helping companies worldwide in developing and implementing top-notch control systems. After evaluating their new client’s needs, Kasa told them about Ignition. Ignition uses up-to-date, proven coding languages and programing standards to make it easily compatible with just about any software. Roker reported how this helped in integrating Ignition at each facility. “Each plant was set up differently, but Ignition’s flexibility made it easy for us to add the additional equipment and screens the client needed,” he said. There is likely no better measure of time savings and productivity increases than looking at how Ignition has positively affected the work flow of the plant’s employees. Jay Aurand is the project engineer for Kasa Industrial Controls, who was responsible for getting the plant floor PLCs connected up with Ignition. He had to work closely with maintenance managers to ensure that the new Ignition control system met their needs. “The maintenance supervisor wanted to see exactly the same data on his screen that he would see if he walked around the plant floor,” Aurand explained. To make this possible, Aurand worked with Kasa System Developer Garrick Reichert to create the necessary HMI screens in the Ignition designer. “After a little training, the Ignition Designer was easy to use and very powerful.” Reichert continued, “We were easily able to mirror the HMI screens that plant employees are familiar with.” Hundreds of HMI screens were created to mirror the local HMI of each machine, on each line, and in each plant. Through Ignition the entire plant floor was visible on a single terminal. 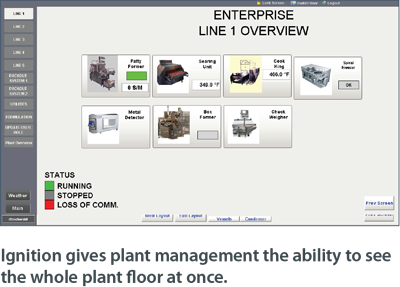 This powerful functionality gave personnel total visibility over all the plants. One particular maintenance supervisor expressed his satisfaction to Jay Aurand: “The supervisor loves that now he can check the whole plant without getting up from this desk.” The supervisor went on to explain to Aurand exactly how much time and effort that kind of easy access to data saves him every day. “He told me that Ignition has saved him 30 minutes, five hand washings, and four smock changes, every time he needs to check the floor,” Aurand said.